This is classic Chanel look fashion set. The gorgeous and stricking antique Italian soutache trim from the 1920s with a lovely subtle sheen decorates the set. The boxy jacket is made from ivory wool and fully lined. A golden beads decorate the front. The matching pencil skirt is fully lined with snap and hook back closure. Worn underneath is a top in navy blue is fully lined with snap back closure. A classic Chanel purse is made from black leather with a black and gold chain and gold double C insignia “clasp.” The purse is functional and closes with a hook. A pair of black shoes with a golden Chanel logo and an insignia Chanel necklace in gold are complete the ensemble. This fashion fits Silkstone Barbie, Model Muse Barbie, Poppy Parker, Victoire Roux, FR2 and Monogram dolls. If you are interested in purchasing this outfit for Vintage Barbie doll, please contact me. All items are designed and sewn by myself in my smoke-free, dachshund friendly home. This fashion fits Silkstone Barbie, Model Muse Barbie, FR2 and Monogram dolls (note that the Eugenia modeling this dress is on an FR2 body). The powder blue dress is fully lined with snap back closure. The powder blue jacket is fully lined and closes at the front with hook. A pair of elbow length gloves in baby blue hand dyed lycra. If you are interested in purchasing this fashion set for your doll, please contact me. 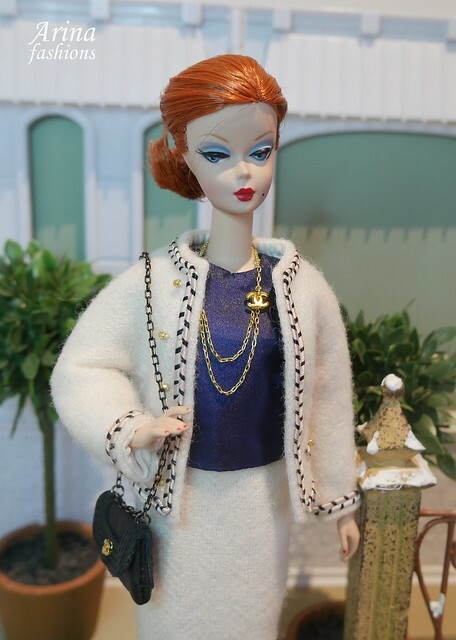 This perfect spring OOAK outfit fits Silkstone Barbie, Poppy Parker and FR2 dolls. The coat (coat-dress) is cut from a lightweight wool blend houndstooth check black and white fabric. The coat is fully lined and closes at the front with hooks. The pink dress is fully lined with snap back closure. The detached white leather belt. 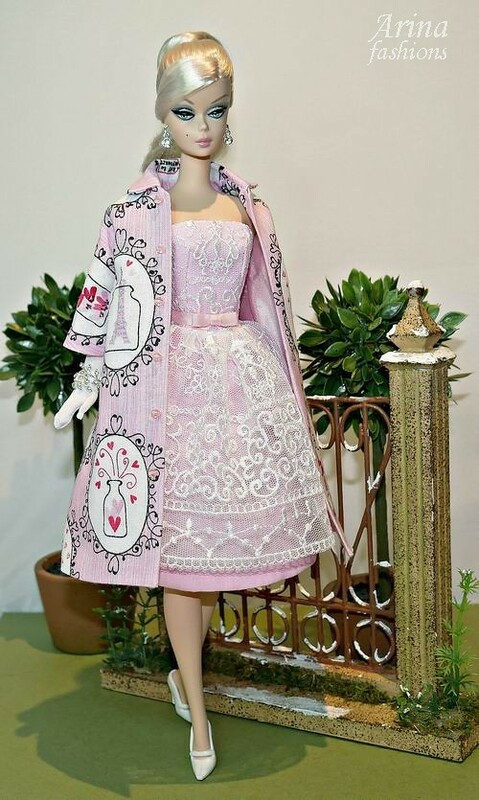 This perfect Valentine’s Day OOAK outfit fits Poppy Parker and Silkstone Barbie dolls. The fully lined coat is cut from a Valentine’s Day Paris Mon Amour Cute Eiffel Tower printed fabric. The detached bow belt with hook back closure. A pair of elbow length gloves in soft white complete the ensemble. Dupioni Silk Dress. Custom order. A classic sheath dress cut from a black dupioni silk fabric, fully lined with snap back closure.